​November is National Native American Heritage Month. 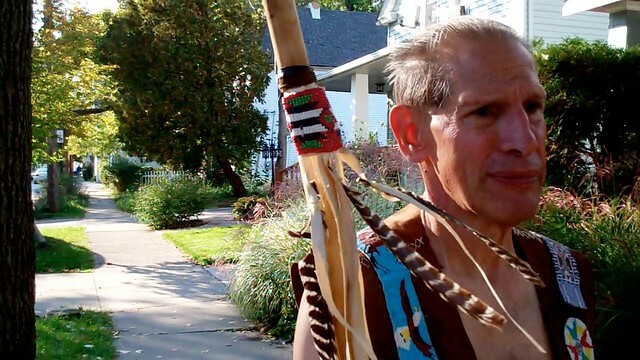 Rocky River Nature Center in North Olmsted, Ohio will host its annual First People Festival in honor of this observance on Saturday, November 19 from 11:00 a.m. to 4:30 p.m. I will one of several interpreters who will engage the public on Native American culture. My interest in Native American culture will amply be on display as I display my artifacts to the public, tell Native American legends, and play my native flutes. I interpret Native American culture to the public. Using short talks and demonstrations, I explain to people how Native Americans lived, survived, and thrived for thousands of years before the arrival of white settlers in North America. Artifacts I use are those I have made or either been made or gifted to me by fellow interpreters. I got into this when I was very young. I would wander through the woods behind my home and imagine how American Indians made bows and arrows out of sticks. I tried to bend sticks like bows and shoot other sticks from them like arrows. Of course, the sticks broke. When I was much older, I decided to learn how the Indians made these things. This passion led me to learn about many other aspects of their culture. As I amassed knowledge about this, I decided to share it with other people. One year, I attended a pow-wow at Atwood Lake in Ohio and asked a Native American to explain an item she was selling. She explained that it was a directional choker. She said, “When you educate people about our culture, tell them about the four colors.” These colors appear on many of my artifacts.